Tell Governor Cuomo and State Legislators: Fund $40M for Community Groups to Get Out the Count for Census 2020! The New York State Legislature will soon engage in budget negotiations for FY 2019-2020. Census data decides how much of the $800 billion dollars in federal funding New Yorkers will receive for the next ten years, the number of seats New York has in the House of Representatives, and redistricting for Congressional, state, and local district lines. An accurate count helps New York's economy, jobs, schools, medical services, infrastructure, political power, and the quality of life for everyone. In order to maximize participation and avoid an undercount in 2020, the New York community-based organizations need funding to step up their outreach and education to ensure every New Yorker knows the importance of filling out the Census. Because of their earned trust and cultural and language competence, community groups are uniquely positioned to reach the hardest-to-count areas. They also can encourage the critical institutions they have strong relationships with, like hospitals and schools, to ensure more New Yorkers are included in the count. View Fiscal Policy Institute’s report here. Click the button below to view the petition and make your voice heard! Thank you to New York Housing Conference for its signature drive on January 29th at its Winter Thought Leaders Series on the census. Thank you to New York Immigration Coalition for collecting signatures at the Chinese Mountain Club of New York’s Annual Meeting. 99 Member Organizations Sign on to Advocacy Letter! See Pages 2-4 for Member Organization names. Advocates Urge Governor to Fund Efforts to Ensure a Complete Census Count – Next Year Will be Too Late. 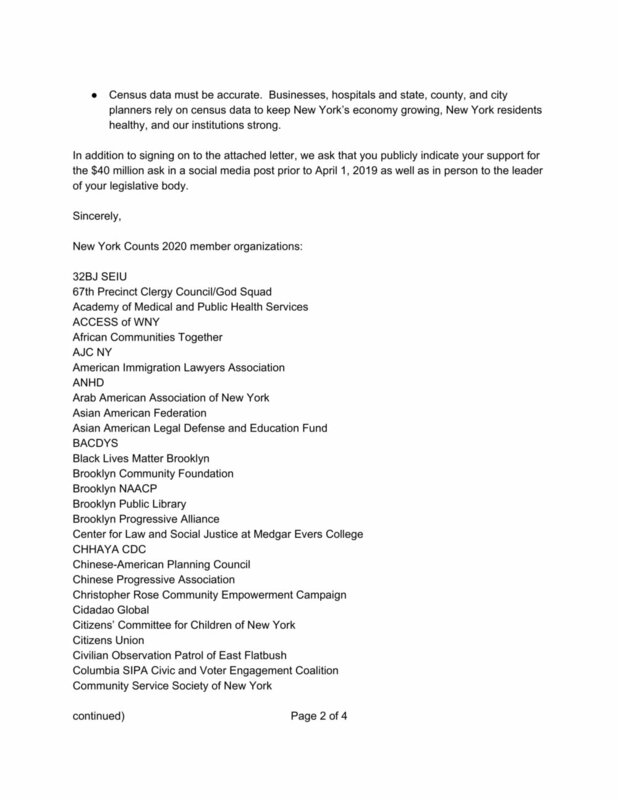 Nearly 50 organizations representing child advocacy; immigration, social justice, health equity and faith groups; and child care, welfare, health and family service providers delivered a letter today to Governor Cuomo urging him to allocate at least $40 million in his 30-day Executive Budget Amendments to ensure a complete and fair census count of New Yorkers in the 2020 Census.